I set off at 10:15 am on Monday morning to make my journey from Aachen back to the Eurotunnel Terminal in Calais. The crossing was at 4:20pm, so I had almost 6 hours for a journey that in the past has taken me between 3.5 and 4.5 hours. 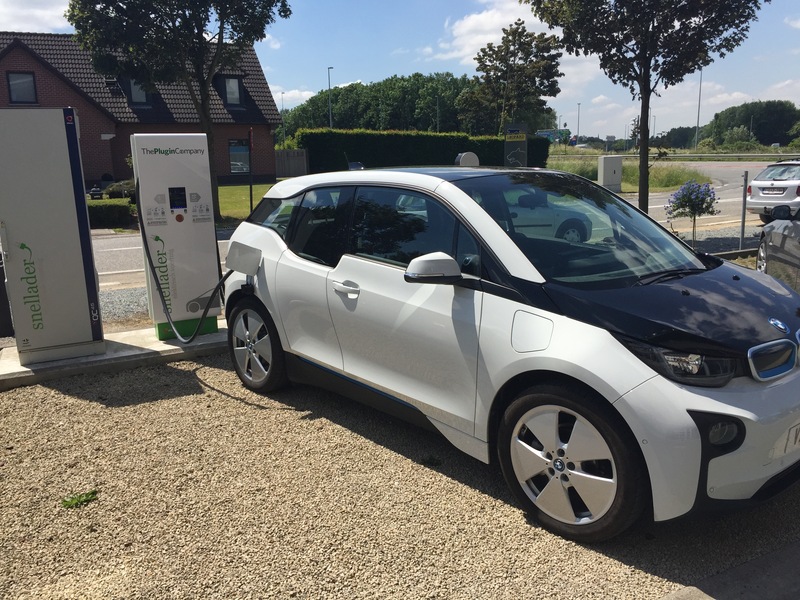 For the return journey I intended to make full use of my Range Extender, meaning to only stop once for a recharge and refuel in Aalst, Belgium. A quick traffic check on the i3’s RTTI (Real Time Traffic Info) suggested no extensive congestion on the feared Brussels Ring – phew! This part of the journey couldn’t have been easier and more normal. I cruised along at 65 mph for about 105 miles, enabled the REx when the remaining SOC was 25% and used it for 50 miles. This free CCS charger is right next to the motorway and once the vehicle was charging, I sat inside and sipped a nice Latte (and took a photo). Altogether I stopped for 35 minutes. Before rejoining the E40 motorway, I also filled up my 9 litre REx tank, which I needed later back in the UK to continue my journey from Folkestone to Maidstone Services. This was another unplanned, yet affordable stop, as I had bags of time left before my Eurotunnel departure. This was just a quick stop for 15 minutes to recharge batteries and minimise the REx use later in my journey to Maidstone, my next rapid charge. I made the tunnel crossing without any hitches and was soon on my merry way to Blighty. I enabled the REx when SOC was down to 25% and I had about 30 more miles to go to Calais. This would enable me to keep a reasonable charge remaining and ensuring I get to Maidstone for another rapid charge. I arrived here with 22 miles left on the REx and 25% SOC remaining. Had a McDonalds Big Mac meal while I waited for my (free) CCS charge to complete. After 40 minutes, I also filled up the REx and contemplated whether to REx it all the way back home or stop again on the M25 Cobham and M40 Oxford Services to minimise REx fuel consumption. As things were going so swimmingly, I decided to go electric for the rest of my journey. Yet another uneventful and pleasant CCS charge. Another i3 REx pulled up when I was almost done charging, but I had no time to speak to the driver. From here I could have now definitely REx-ed it all the way back home, but I decided to stop at Oxford Services and charge up one last time. After an 800 mile journey, I experienced for the first time an occupied charge point! I pulled into the Welcome Break Oxford, only to find a Nissan Leaf using the rapid charger before me. Luckily, he was almost done and after a 10 minute wait I plugged in and recharged my i3 for 20 minutes with enough electrons to make it back home without any immediate emissions. I arrived back home at 9:30pm after a total journey of over 860 miles, of which about 150 miles (17%) were driven using the i3’s Range Extender. However, it would have been possible to do this journey fully electric by using slower Type 2 chargers, for example. However, as I pointed out before, the beauty of the REx in situations like this is that it gives you the flexibility to simply carry on to the next rapid charger. In terms of cost, I spent €8 for a CCS rapid charge at FastNED and €15 on REx petrol. €23 for an 860 mile journey is not too shabby, eh? Granted, the majority was based on free rapid charges, which might be different in the future. But the extend of costs for this remains to be seen.